There are so many beautiful species of snowdrop, but if you’re hoping to create an impressive swathe you can’t beat Galanthus nivalis. It’s the most common species because it self-seeds and spreads very quickly, which means you’ll get to enjoy your snowy white display sooner. Always buy pots of snowdrops ‘in the green’ – this means once they’ve finished flowering but while the leaves are still intact. This could be any time from mid-January to early March, so keep an eye out at your local garden center or National Trust plant shop. Once you get your snowdrops home, plant them as soon as possible. The best location is somewhere with partial shade such as under a tree, and with moist but well-drained soil. It’s worth adding some leafmould or garden compost to the soil to ensure you’re giving the plants plenty of nutrients. Plant the snowdrops at the same depth they were previously grown – you can often see this where the leaf stalks change from white to green. If you can’t see the level clearly, then just plant the snowdrops around 4 inches deep, and if you bought multiple clumps then space them about 6 inches apart. Water the plants in, and then you can leave them alone – the foliage will die back and become food for the bulb, ready for next year’s display. Within a couple of years each clump will have grown to fill the gaps you left. As the years go by, you can to help your snowdrops to spread by lifting and dividing any large clumps. Carefully dig up the clump and prize it apart with your hands into smaller chunks. Discard any diseased or dead bulbs, and then re-plant each new group 6 inches apart. Over time you’ll end up with a beautiful white drift of snowdrops every spring. It’s hard to imagine a British spring without snowdrops, but did you know that they aren’t actually native to the UK? Historians believe they were probably introduced from Europe in the late 15th century and cultivated varieties became popular in Elizabethan gardens, but it wasn’t until the 1770s that they were first recorded growing in the wild. Snowdrops’ scientific name is Galanthus, which translates as ‘milk flower’, but over the years they’ve gained other names such as ‘February fairmaids’ and ‘Candlemas bells’. They’re often seen to symbolize purity and hope, but folklore also states that taking a single snowdrop inside will bring ill-fortune, hence another name – ‘death flower’. Alternatively it might just cause your milk to sour and eggs to spoil, which isn’t quite as ominous. There are 20 species of wild snowdrop, of which Galanthus nivalis is the most common. 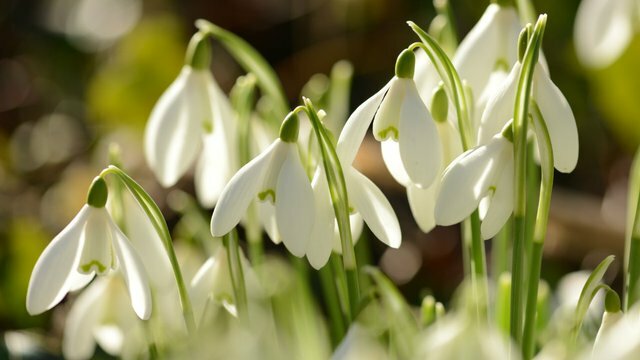 Over the years, green-fingered fans have used these original species to cultivate over 1000 new varieties, the best-named of which has to be Galanthus ‘Heffalump’. Sometimes the snowdrops themselves create new varieties by cross-fertilisation, such as Galanthus ‘Ailwyn’, which was discovered at Anglesey Abbey in Cambridgeshire in 1994. Bees love snowdrops. They’re a vital source of nectar early in the year when not many other plants are in flower. Snowdrop buds have a hard tip that helps them break through frozen soil. The sap also contains a type of antifreeze which helps to protects them from frost. Snowdrops contain an alkaloid called galantamine, which has been used to help manage mild to moderate cases of Alzheimer’s. Many National Trust properties have beautiful displays of snowdrops at this time of year. Learn which estates to visit throughout the country.